1The World Wide Web was officially born in 1990, in the wake of the work of Tim Berners-Lee. It was a global Web, at least as wide in its scope as it was wide-ranging in its content. Over time, this content ballooned, making it essential for everyone to use search engines based on the principle of ranking “by relevance” to impose a semblance of order on this fertile chaos. This was the first Information Age of the Web. 2Then came the World Live Web, an instantaneous Web, a Web showing the latest published information in real time. The Google News service was one of the pioneers of this second Information Age, alongside the explosion of blogs and sites or portals enabling the instantaneous syndication of content and countless document fragments that were no sooner published than they were indexed and accessible. 3Now, with the extraordinary rise of social networks in particular, we have entered the third Information Age: the World Life Web. This is a global Web, a matrix within which individuals now occupy the space that was previously inhabited by documents and updates. The main question posed by this new age is the indexable nature of human beings themselves via the traces they consciously or unconsciously leave on the network, that is to say the question of their digital identity. This identity, or e-reputation, functions as the marker of a digital presence that is often diffuse and difficult to grasp as an end in itself or a construction of self, so numerous and complex are the interacting parameters at play: simply browsing the network at random, the tracking of behavioural information about our online purchases for marketing purposes, the wilful vagueness of terms and conditions, the ambiguities of privacy policies attached to the different services we use and, lastly, the logics of complex algorithms which mean that that this mass of data is only partially rendered, and with inevitable bias. ERTZSCHEID, Olivier. 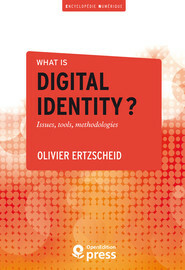 Introduction: The World Life Web In : What is digital identity? Issues, tools, methodologies [en ligne]. Marseille : OpenEdition Press, 2016 (généré le 18 avril 2019). Disponible sur Internet : <http://books.openedition.org/oep/1378?mobile=1>. ISBN : 9782821855793. DOI : 10.4000/books.oep.1378. Ertzscheid, Olivier. “Introduction: The World Life Web”. What is digital identity? Issues, tools, methodologies. By Ertzscheid. Marseille : OpenEdition Press, 2016. Web. <http://books.openedition.org/oep/1378?mobile=1>. ERTZSCHEID, Olivier. What is digital identity? Issues, tools, methodologies. Nouvelle édition [en ligne]. Marseille : OpenEdition Press, 2016 (généré le 18 avril 2019). Disponible sur Internet : <http://books.openedition.org/oep/1235?mobile=1>. ISBN : 9782821855793. DOI : 10.4000/books.oep.1235.